Traditional foods are all around in the weekly catalogues. 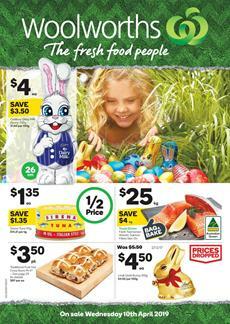 One of the best of the grocery is the Woolworths Catalogue and it offers so many Easter products. Shop hot cross buns, Lindt Gold bunny with a dropped-price. European tastes are the core of the food of Easter. Brioche hot cross buns reflect the cuisine of Northern and central Europe. You can buy Brioche ice cream and Hershey's hot cross buns for only $3.50! Seafood is one of the important categories of the food range of Woolworths. Seafood booklet is available at Woolies. Great recipes are said to be in the content of that booklet. Ocean Blue cocktail prawns will cost half. 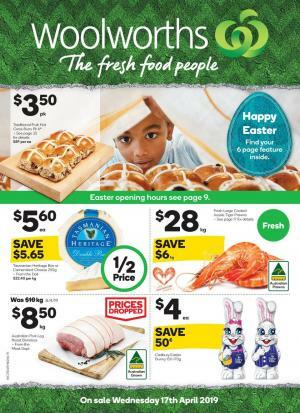 Buy Seafood for Lent at Woolworths. Birds Eye ovenbake will cost $4.65! You can buy a 26cm Cadbury crunchie bunny for only $4! Whatever they make, nothing can impress me like fan products. I am a fan of Star Wars and a Darth Vader hollow Easter chocolate would be my favourite from a product range like this. Woolworths offers them on pg 7-9. The catalogue is also rich in snack variety. Find Pringles, Gatorade, Kettle's, and more in the pantry sale. Follow our Facebook page to get all the Woolworths news. Find traditional candies, Easter eggs, bunny, Cadbury products, and more in the Easter confectionery range of Woolworths Catalogue. To browse this part, please go to pg 10-15 of the catalogue. Woolworths Catalogue showcases a range of savings on extraordinary candies and chocolate boxes. For example, Lindt Easter Gala box 400g pack is only $20 with a $10 saving. Buy gifts from the chocolate boxes shelf of the Woolies. A great example of what could be a gift in Easter is Ferrero Rocher pk 30 which is only $11 at Woolworths. Save $8 on that collection of chocolates. Also, there are more savings and half prices in the Easter treats. Accessories and decoration items can also be interesting for many. Buy Easter premium character wire basket for only $8! Traditional products of chocolate and confectionery will also be present with the prices from this catalogue. Get a Lindt Easter gold bunny for $4.50 at Woolworths this week. Seafood for Lent is one of the most popular categories of the food range of most catalogues. You can buy Birds Eye deli chips getting bonus tiles for only $1.97! More like John West's packaged or canned fish variety is available on pg 17. Make a great pasta with the product on pg 18. Zafaretti pasta of 500g is only $1. Save $.50 on that pasta. You can also find Dolmio pasta sauce which is an iconic product when it comes to making a delicious pasta meal. Get 10% discount on fresh mincemeat. Also, save on beef porterhouse steak, lamb forequarter chops, and more meat products on pg 22. Fresh and packaged bakery products are on pg 23. Buy Crusty entertainer rolls for only $3. In the deli, you will also find savings. Save $5/kg on Bertocchi Venetian spicy salami. Motives of Easter and traditional foods are a major part of the latest Woolworths Catalogue snack range. Also, special Woolworths Easter sale is available in the catalogue. Cadbury egg crate pack is one of the examples. Pay only half of the regular value for that. Easter egg hunt will be so much fun with the price drops and profitable deals from Woolies. Hot Cross Buns will cost only $3.50 starting on Wed. Restock snacks, soda packs, chips, candy bags, coke, and get bonus tiles with participating items. You can save $1.50 on Pringles 134g pack. Favourite soda packs like Coca-Cola and Pepsi Max are available in the latest range of Woolworths. More is also available. For example, save almost half ($1) on Schweppes traditional soft drink of 1.1L. Discover the new flavours and introductory prices new products from the snack sale. Smith's chips and Arnott's cracker chips have their introductory prices on pg 4. Save $5 on Oral-B 5 way clean toothbrush pk 3 or enamel restore toothpaste and get bonus tiles. If you run out of coffee, there are some at Woolworths supermarket who offers the best prices of their week. Robert Trimms instant coffee of 200g will cost half price. Pay only $4 and save $4 on that coffee. Breakfast shakes with milk are a quick and nutritional way to go. Netlé milo is $9 and you save $3. Protein is the priority in the process of growth of children. So many alternatives for breakfast will provide the protein need. Nice & Natural whole seed protein bars of a 150g pack is going to be a half-price deal. Save $2.50 on that product and many others. Easter confectionery is also an important little part of the latest Woolies catalogue. Check out Cadbury favourites, Lindt Lindor, and more brands of Easter eggs and Easter bunny. Follow Woolworths Catalogues with a free subscription providing your email or follow us on Facebook to track the future sales. One of the easiest ways to save on general grocery products is to look for the deals on Woolworths Catalogues. Browse the best price range of weekly food items including snacks, fresh produce, nutritional shakes, candies, packaged meals, sweets, Easter products, ingredients for cooking, pantry items, delicious deli-bakery, fresh-cut meat, deli meat, and more beautiful things that will whet your appetite. In the pantry range of Woolies, find Bega peanut butter, Kellogg's LCMs bars, Heinz baked beans at half prices. Buy Nutella for a $1.75 cheaper price. Check out the price drops of LeSnak and Australian capilano honey. Get your coffee at Woolworths. There is nothing better than a fresh coffee for a coffee person. I am saying this because you can also be a tea person. Some people like it with tea. It also contains a considerable amount of caffeine. You will find both of them at Woolworths supermarket for the catalogue prices. Browse Australia's Own almond milk, Jarrah flavoured, Twinings Earl Grey, Lavazza freeze-dried coffee, and more products are available at half prices. Quick foods combine to form one of the most popular parts of all Woolworths Catalogues. Check out the Dr Oetker pizza, Lean Cuisine, ice cream, other popular brands, and more from the Woolworths Catalogue. Get Disney Words that are only available 2 more weeks at Woolworths supermarket. A classical type of snack sale is available on the latest Woolworths Catalogue. They are not all simple snacks to snack around, some of them are perfect breakfast foods. Oreo cookies are one of the most popular biscuits especially among business people who wake up early in the morning. Quick carbohydrate source for the boost of nutrition at the beginning of the day. Moreover, Woolworths has an Easter sale. Find Easter Mini chicks, bunny ears, foam stickers, and Easter eggs. Cadbury Easter small egg bags are on sale this week. One more great product from the Easter range of Woolies is Lindt Mini egg bag that will cost only $8! Seafood for Lent is one of the best categories of all catalogues in recent weeks. Shop for the Sealord dory fillets, Birds Eye packaged seafood, Fishy nuggets, John West canned seafood variety, and more on pg 12-14. If you want the snacks to be one of your main meals, I can recommend you to see pg 16&17 where many breakfast biscuits, nutritional products, and Nutella are present. Browse the entire catalogue range of Woolworths, follow our Facebook page, subscribe to the newsletter to get emails.